Welcome to our first Race Simulation Day of the 2017 season! This event provides an opportunity to practice as many parts of the multi-sport experience as you want, in a similar setting to what you would experience on race day (hopefully with fewer nerves though). You are welcome to come to swim bike and run, or swim and run, or swim and bike, or bike and run. Our two NCCP certified coaches will be available to provide assistance and advice. Open to members and non members of FMCT club. This event is sanctioned by Triathlon Ontario, thus all participants must provide proof of active TO membership. Participants without a TO membership will be able to purchase a one-day access for $8 and by signing a TO waiver. Click here to download this waiver. There will be no water stations on the bike and run courses, but water and Gatorade will be provided in the transition area. Participants are welcome to come through at any time during the event to get a drink. A small “race-kit” including a bib will be provided to all participants. Please arrive 30 min before the start of your event to set up your spot in the transition area and make yourself familiar with the venue. All participants must check into the Transition area before starting their event. Coaches will be available from 8am until 8:30am to provide assistance in transition. Will contain a bike rack and a table with water and Gatorade, as well as bananas and pretzels. 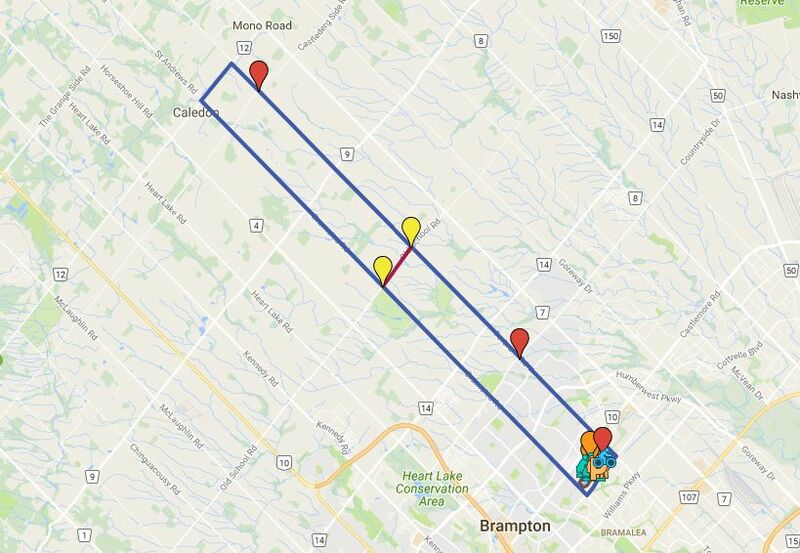 34.5km: One large loop to Old Baseline Rd by Bramalea Rd. and back via Torbram Rd. 50km: One large 34.5km loop and one 16km inner loop by Old School Rd between Torbram and Bramalea. 66km: One large 34.5km loop and two 16km inner loops by Old School Rd between Torbram and Bramalea. 82km: One large 34.5km loop and three 16km inner loops by Old School Rd between Torbram and Bramalea. You can do as many loops of the run course, and may run in either direction. You can even change directions between loops. Whatever combo you can think of! Send us an email to sign up!